Don’t accept any compromises when it comes to the accuracy of color measurements. Read more about our innovative product LumiCam 1300 Advanced. This new imaging photometer and colorimeter has been designed for the highest precision when analyzing the characteristics of displays and panel graphics. The camera is based on an innovative 6-filter technology. In combination with a patent-pending procedure, it allows very accurate adjustment to the eye sensitivity functions using the data recorded from the six channels. 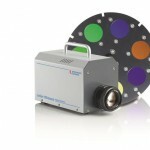 The LumiCam 1300 Advanced offers excellent accuracy for the color coordinates particularly when taking measurements of narrow-band LED colors.